A new version for free note taking Application, MyNotex has been released that brings support for importing notes from Tomboy and Gnote. Many other features have been added. Link to a file, web links and mail addresses can be easily inserted by using prefixes like "file://", "http://", "www." or "mailto:"
MyNotex is a free note taking application written in Lazarus with a unique hierarchy system where under a broad Subject heading, notes can be maintained and further categorized by title, date, and tags. MyNotex has an impressive list of features as it supports adding attachments, importing notes from other file formats, exporting to file formats supported by OpenOffice and LibreOffice, html etc., data synchronization and encryption. 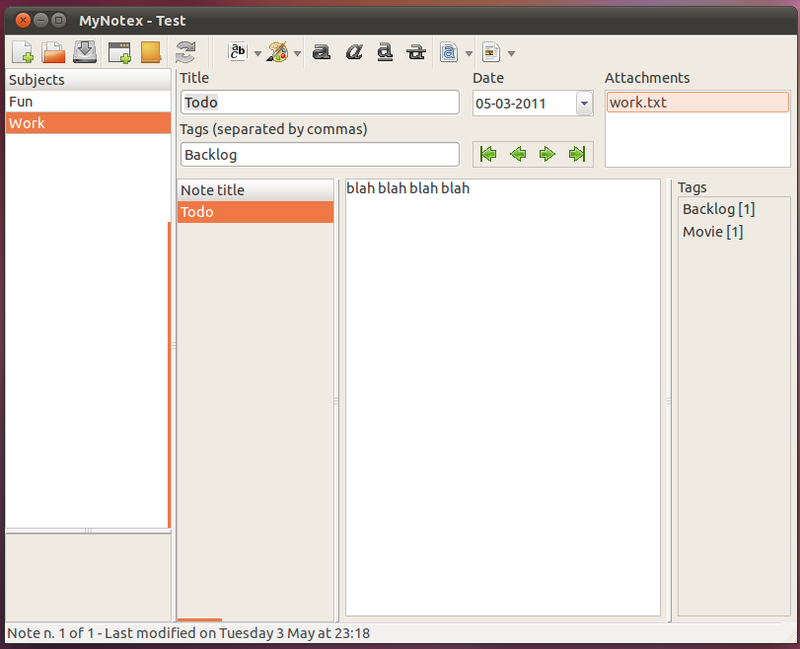 MyNotex uses Sqlite as main project database and not XML. Also notes are not presented in tree like structure but in a Grid like format, which according to developers makes it more powerful, efficient and fast. Lastly, MyNotex supports online synchronization as contents of a project folder on one system can be synchronized with another project folder on another system using simple sharing over LAN etc. or using other services like Dropbox and Ubuntu One. Many thanks to Massimo Nardello for the information.